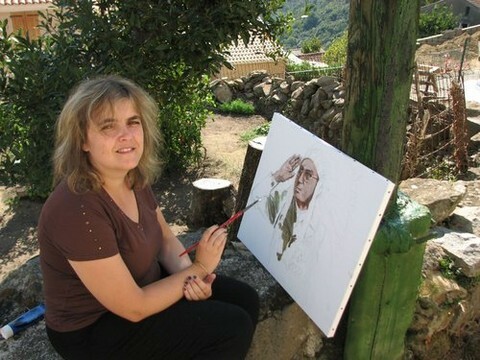 At the last meeting of Solaro artists Village, Béatrice Tozzi resided in the family house and it is 'child' of the village that she has exhibited his latest works. The young woman is involved since 2003 in this cultural event. Sensitive and modest, she is touched to each new edition to meet an audience genuinely interested in his portrait work. "Since childhood, I draw. I use an uncommon method, the ballpoint, which also begins to be recognized in the artistic environment, because it allows gradients ranging from light grey to dark grey,"she explains. This artist has received the gift of the drawing in legacy. "My father has achieved in his life some beautiful sketches and my uncle Peter gave amazing drawings while he was still in primary school. I found class, music, decorated notebooks to ink China and sketches of sailboats which are of a very high intensity. "Unfortunately, this talent could prove because the young man died at the age of 18 years. Fascinated by the Amerindian cultures, his quest for light translates vivid portraits of the people whom she knows well the history and wisdom. It does not however forget drawing and his island with compositions in the form of Corsica which reflect the themes of the island culture. 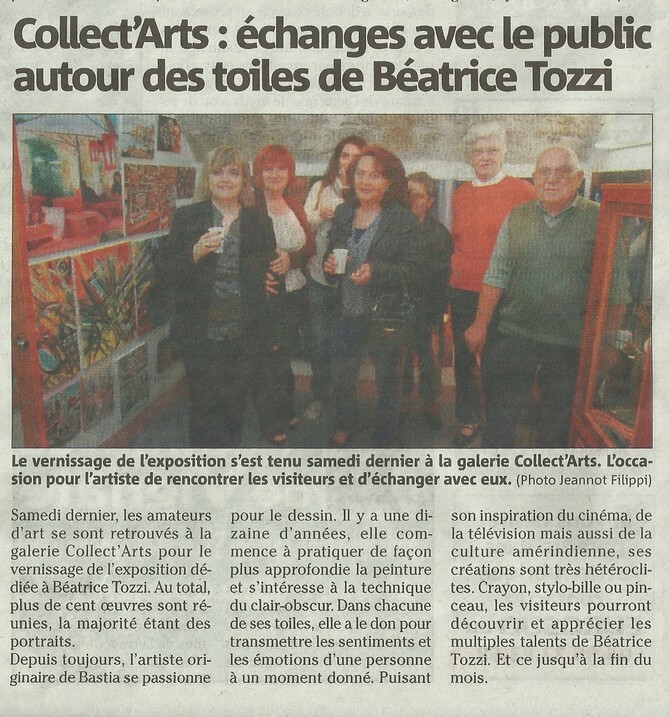 In a few days, Béatrice Tozzi will join the college of Mouans-Sartoux near Cannes, where she teaches as Professor in Fine Arts. But if she reluctantly leaves his village and his family, his works remain still visible in exhibitions in Bastia, or Collect Gallery ' Art de Corte. 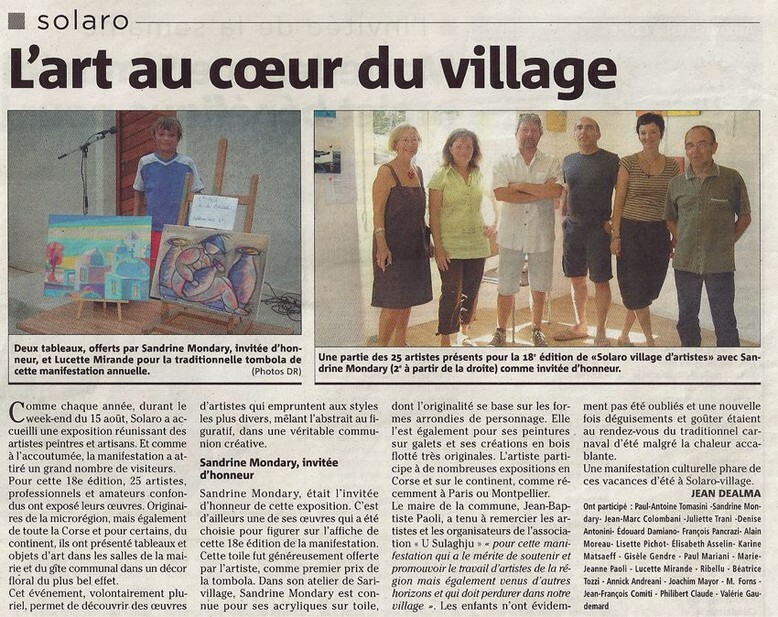 The artists painters, sculptors and craftsmen (pottery, Cutler, or glass, among others) from any Corsica have visit today to the village of Solaro. Organized every year by the municipality and the association «U Sulaghju», the «Solaro artists village» event takes place indeed for three days, until next Sunday. Alongside the organizers Annick Andréani, Sandrine Mondary, Karine Matsaeff and Patrice Clerget, the municipality also offers, as always, animations for children on the sidelines of the exhibition. The traditional Carnival in August 15, but also walks to bumps are for example provided. Note, on the other hand, the beautiful poster of this 2010 edition is a reproduction of a work by Denise Antonini, painter native of Ventiseri, who is also presents among the exhibitors. The original painting will be offered to the winner of the raffle draw. Three beautiful days that so animate the village and will allow artists to discover once again their sensitivity and their talent. 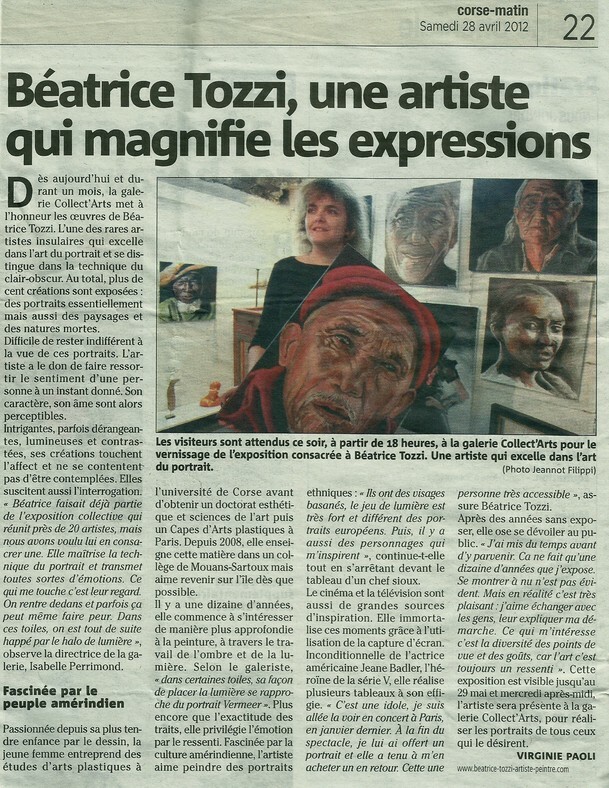 (*) The artists: Denise Antonini, Elisabeth Asselin, Jean-Marie Campana, Patrice Chiang, Jean-François Comiti, Edouard Damiano, Chantal Delanaux, Frederic Federzoni, Michelle Fontana, Robert Forns, Jean-Claude Garsaball, Daniel Gualandi, Paul Mariani, Monique Martin, Maurice Martinez, Karine Matsaeff, Joachim Mayor, Sandrine Mdirector, Alain Moreau, Josiane Ogier, Paula Orsini, Marie-Jeanne Paoli, Lucette Pons Mirande, Anurag, Giovannina Ricci, Béatrice Tozzi, Juliette Trani, François Vincensini.